UDM Downloads > Pocket PC Forensic! Pocket PC investigation software is fast and cost effective application for all users to immediately examine full information from window based mobile phones. PDA surveillance program is specially designed to absolutely control all forensic cases like mobile snatching, mobile robbery and many more. Smartphone forensic application supports all major windows mobile phone brands (Samsung AT&T Tilt, Audiovox, Anextek SP230SGH-i300, Samsung SCH-i600, Sharp W-Zero3, HP iPAQ, Hitachi, Motorola, Nokia, Hitachi, Blackberry etc). Mobile phone examiner utility is able to capture all relevant details of cell phones such as phonebook contact details, dialed, received numbers, call duration (incoming and outgoing), text document, images, audio files, video clipping etc. Pocket PC forensic program easily used in several forensics organizations where maximum crime cases can be solved by analyzing cell phone. PDA investigator software is compatible with all windows operating system based PC or laptop and Pocket PC mobile phones handsets supported by Microsoft ActiveSync and Windows mobile device center. Advanced smartphone analyzer utility allows you to immediately extract audio, video files, folders, text messages, contact numbers from any PDA or similar mobile phones without losing any data. 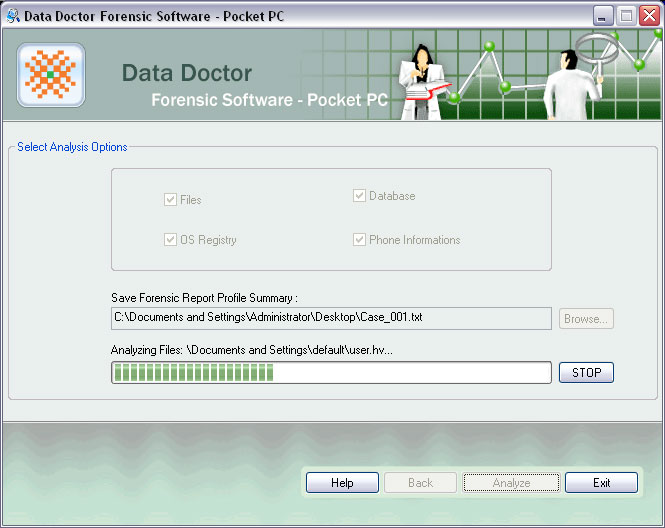 Pocket PC forensic application provides interactive GUI for easy working with software. Features: * Pocket PC forensic tool can gather whole PDA data and all hardware related information like IMEI number, manufacture name etc. * PDA investigation tool extracts data from all windows based mobile phones and helps forensic officers to solve their cases without losing valuable time. * Advanced windows mobile examiner utility can fetch data from both SIM and phone memory and efficiently saves data into txt file for future reference.